When bringing up the subject of investing in commercial real estate versus residential real estate one will always spark an enlightening conversation. Any real estate professional is aware of the benefits involved in real estate investing. Property owners benefit from significant cash flow, tax advantages, positive leverage and reduced risk. The first thing to keep in mind is how different commercial property is vs. residential property. We have all heard the “Three Most Important Attributes in Real Estate is Location, Location, Location”. While Location is an important attribute, it is not in the top three. On the contrary, it is number “4”. 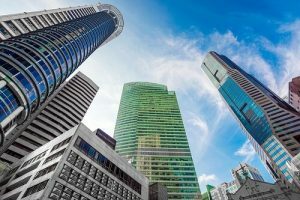 Let’s take a look at the three most important attributes in order when investing in Commercial Real Estate and compare it to Residential investing. Credit Risk: Credit is the always the most important attribute. It is the credit of the tenant that pays the rent to the investor. Speculative credit can cause cash flow to vanish overnight. It is important to determine if you are dealing with a credit (S&P rated) or non-rated tenant. Compounding leverage with poor credit is a recipe for disaster. In Residential investing, typically you are dealing with a tenant that is 2 months from going broke. “What happens if he loses his job? “Is he going to pay the rent?” I don’t think so. Lease Risk: Long term leases are more the norm in commercial investing. Retail leases can be 5, 10, 15 years in length with escalations along the way. Compare that to Residential where you have leases from 1 to 2 years. Constant tenant turnover can cause increase leasing expenses and increased risk. Operational Risk: “Who pays for What?” A simple question, but it can make all the difference to your total return. In commercial retail investment property, most if not all expenses are payable by the tenant. Repairs and maintenance to HVAC, plumbing, electrical, landscaping, etc. are expenses that are passed through the tenant in NNN leases. In residential, tenants may be responsible for electric and cleaning the premises but the bulk of expenses falls to the Landlord. Items such as landscaping, appliance repair, plumbing, HVAC, roof repair…the list goes on and on! So where does Location come into the mix. Location is important, but in and of itself it does not directly contribute to the cash flow of the investor. Sure we want a property in a location that will continue to develop and generate increased vehicle trips per day (VPD) by the door, but take time to analyze the credit, lease and operational risk first.